NITSA: Spot Wildlife & Be Adventurous!! Jim Corbett National Park!! Spot Wildlife & Be Adventurous!! 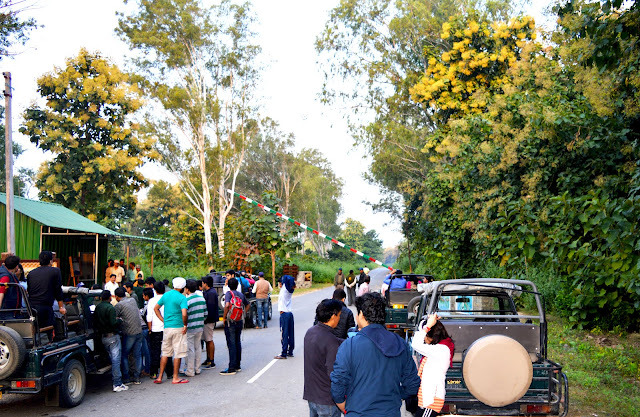 Jim Corbett National Park!! Ever wondered about reasons why we travel? Ever wondered about the reason why we feel like there is a need to travel? Most of you will recall that we wanted to rejuvenate ourselves. Or will say that we made this plan because we wanted to explore something new. Reasons can be million but the aim is only one to make ourselves happy. So don’t just push yourself to cross the limits or to reach an extent. Sometimes push yourself to take a break. This trip actually happened in those days when I was working as a Software Engineer in a Corporate World. Yes a trip with my colleagues who are also my friends. Many of you must be very well acquainted that a break is more than a boon for corporate people. We were quite often having discussions about opting for a place to visit. Age factor playing an important role urged us to decide for some place filled with adventure along with fun. Jungle Safari seems the best option to all of us. 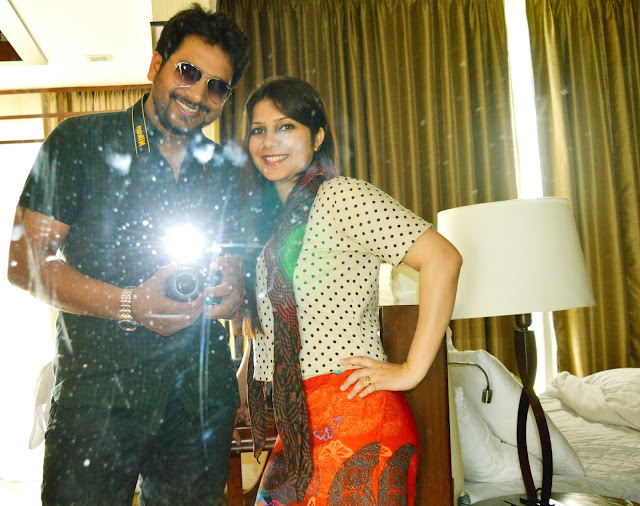 So Jim Corbett was finally check listed. Now was the time to list out the options for the stay. Ramanagar in Uttarakhand is the small town which is famous for being the gateway to Jim Corbett. 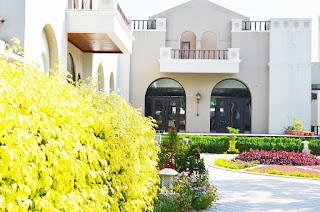 Mostly the luxury resorts to stay in are located in the outskirts of Ramnagar. But this luxury stay comes with one drawback, that there is very little or no availability of food outlets outside. So you need to get yourself booked with ‘All Meals’ in this case. Small Food Outlets or restaurants are available in the main town of Ramnagar. Also it is advisable not to wander on roads or go outside on the roads of Ramnagar after 6 PM. First of all it is quite dark after that and the street light facility is very less. Also there is a fear of wild animals. Starting with the appraisal I wanted to mention that the stay at this resort filled my heart with pleasure. 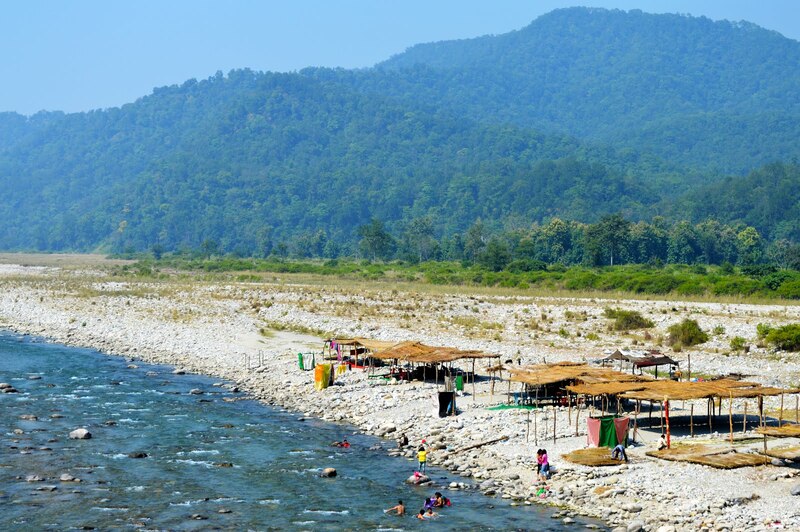 Situated in the Dhikuli district, this resort comes with the presence of Kosi River flowing at the back of the Resort. We spent some of our evening time enjoying at the bank of Kosi River. I invited all of my colleague friends to join us. We had lots of fun and also had fun filled photo session. After all we were the masters of our own happiness. The rooms of the resort are also very posh with free Wi-Fi, TV, mini bar, Separate Bedroom with an adjacent Sofa Room and luxury all around. Rooms with balcony, amazing gardens and an outdoor pool add to the beauty. Indoor and outside Restaurant providing view of the garden and the pool is also one of the soothing experiences. I am not going to miss to mention that the Gardens are very well maintained and top class. Cycles are also available for transfers from Reception to the room. You can also use the cycles just for fun purpose. We had booked for all the three meals at the resort. The food was just awesome. I should not miss to mention this also. The food here is worth praising. Kosi River is one beautiful attraction among this wild life. 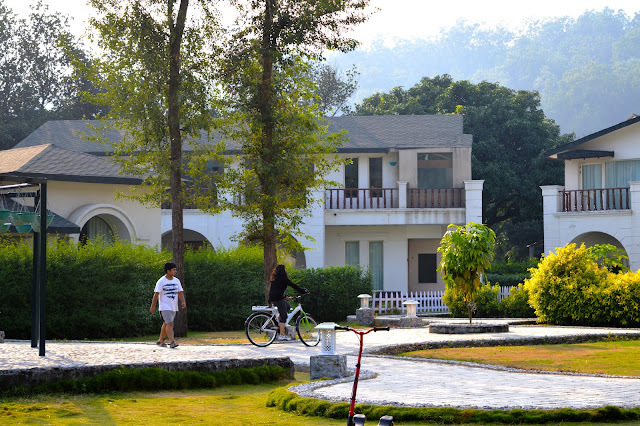 It is situated at the bank of many of the resorts in Jim Corbett National Park. Mountain View from here is liked by few of my friends the most. It is such a quiet place that you can hear the voice of water flowing. Lots of small and big rocks provide you the chance to sit and enjoy the calmness of the nature with your feet dip into water. 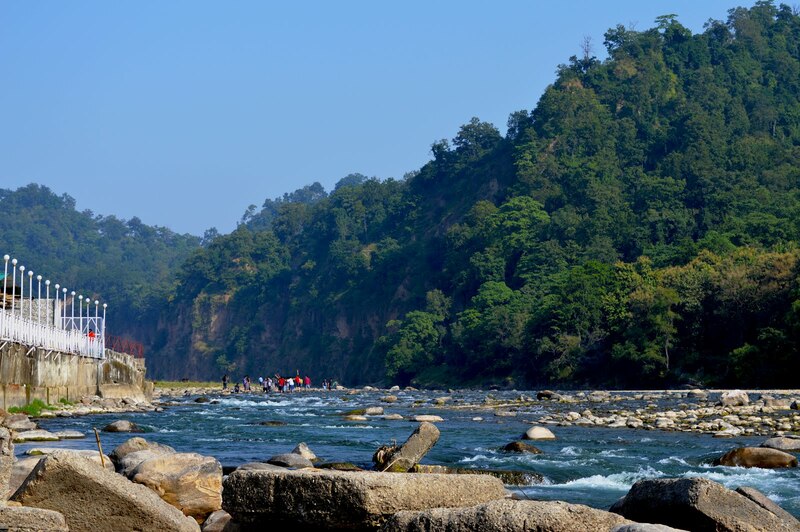 My stay at Hridayesh Wilderness provides me with the facility to enjoy at the bank of Kosi River. If your stay in Jim Corbett does not provide you this facility, then don’t get disheartened because ‘Garjiya Devi Temple’ provides you with the one. On the first day itself, after checking in we freshen up and got ready to wander through the resort and have a look at its beauty and facilities. My room was facing the river and so we had already decided to start our sightseeing with the Kosi River itself. I was very happy and filled with fun. We held our camera and starting moving towards the bank of the river. We both were very fascinated by the beauty and maintenance of the garden. Breathing in the pure air we reached the bank of the river. Our friends had also joined us by this time. We starting jumping through the rocks and gathered as much fun as we can and added them into our memories. We had already kept our shoes on one side of the bank of the Kosi River before entering. After we started feeling little tired by jumping here & there and chasing each other via rocks, we sat down with our feet dip into the serene water. Cold water passing by us and touching our feet gave us the immense feeling of relaxation. 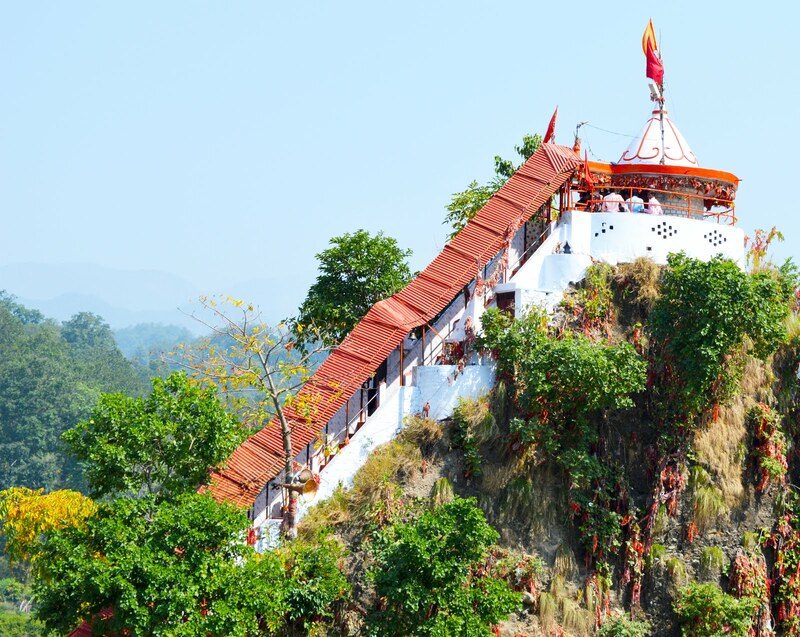 Garjiya Devi Temple is situated in the mid of Kosi River. You need to climb up the stairs to reach the temple. The temple provides you with the best of the view, with river crossing through the temple and forest all around. The place is very clean and calm. 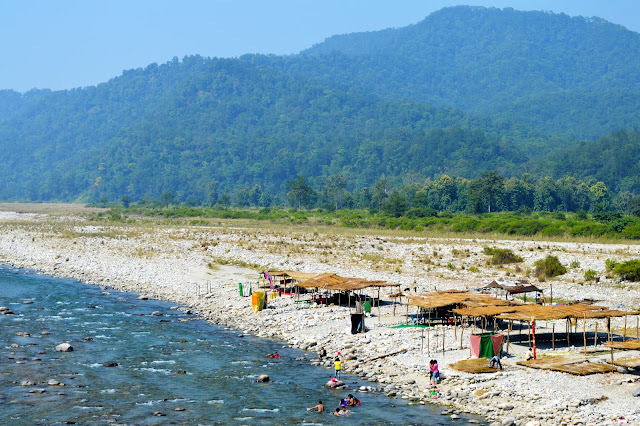 People often come here to visit the temple and then move down at the bank of Kosi River. Wild animals also come at the river to drink water. You may be able to get the chance to see these wild animals. The weather was quite hot though. I had already taken a water bottle with me. The temple is just 4 kilometers away from our resort. It hardly took us 10 minutes to reach temple. At the entrance of the temple, there are lots of Prasad (food item consumed by people on the name of god) vendors. People do buy Prasad as an act of gratitude to god. The Prasad is first offered to the god, and then distributed to people on his/her name. Prasad is known to be a gracious gift of god. Then we encountered a bridge. After crossing the bridge, we climbed up the stairs to have a glance of Garijiya Devi. People can spend as much time as they want as an act of devotion. But as we are on this trip following an itinerary and had to move forward to the next destination, so we stepped down towards Kosi River and enjoyed the scenic beauty it was providing us. 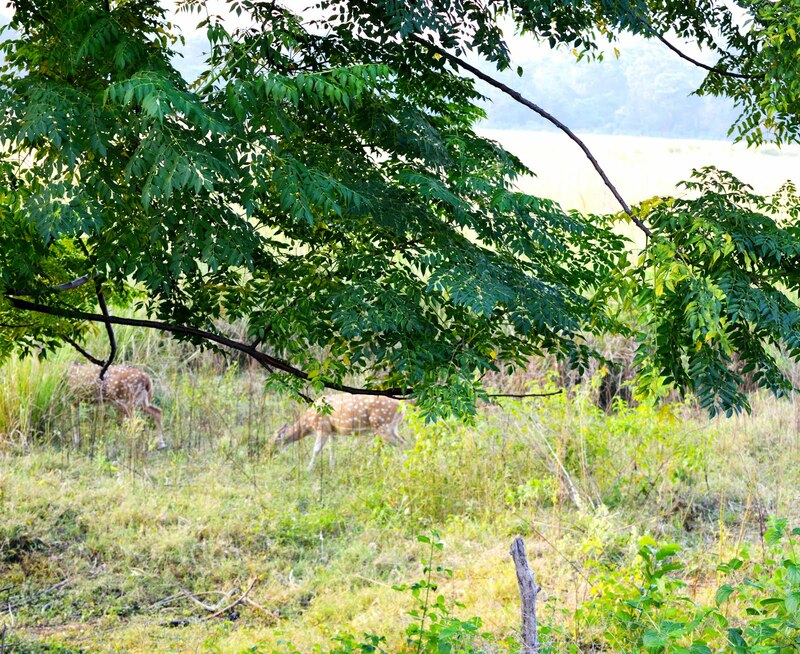 a. Dhikala Zone is the largest zone of Corbett National Park and consists of many forest lodges for visitors to enjoy in between safari. This zone is famous for the list of fauna including Bengal Tigers, Crocodile, Cobra, Elephants, etc. Entry gate of Dhikala Zone is known by name Dhangadi Gate. This Zone is open for visitors from Mid of November to Mid of June. b. Jhirna Zone provides the facility of rest houses for visitors inside the Zone. 16 kilometers away from Ramnagar this zone is famous for providing the view of Wild Bear. The entry gate is also named by its name, Jhirna Gate. It is open from October to End of June. c. Bijrani Zone is just 1 kilometer away from Ramnagar and is famous mainly for its ability to provide the view of beautiful Wild Birds. Wild animals including Elephant, Monkeys and Deer can also be seen. The entry gate of the zone is called as Amdanda Gate. It is open from Mid of October to End of June. d. Durga Devi Zone is mainly for bird lovers which gives you the sight of birds. The entry gate is called as Durga Devi Gate and is open from mid of November to End of June. Besides these Zones there are two kinds of Safari available that are mentioned below. A prior reservation is required in both the Safari’s. a. Jeep Safari: Only 30 jeeps are allowed for the Safari at one time. So make sure to do prior booking so that you don’t need to come empty handed. Safari timings vary in summers and winters. Approximately 6 to 9 in the morning and 3 to 6 in the evening. Approximate costing of Jeep Safari is Rs. 3600 for 6 people. b. Canter Safari is a bus that accommodates 16 people at one time. Canter Safari is available only for Dhikala Zone, Open from 5:30 to 12:30 in morning and 12:30 to 6 in the evening. Timings vary slightly in summer and winters. This is the most exciting activity for which we were waiting from last one day. Safari was the main concern for us to come on this trip. The toughest task for the accomplishment of this activity was to get up early at around 5 AM in the morning. I and Nitin, both are late risers. Ha-ha. We managed to get up early because our will to go on Safari was higher. One by one Jeeps were coming to pick us up and we were settling down in the Jeeps in the group of six. To add on I would like to mention that I am a great admirer of Jeep and Bike rides. I love them. So imagine how much I was enjoying. First of all, Safari and the other thing is ‘Safari in a Jeep’. Yay. I was not even bothering to manage my hair. I was just enjoying the flow of air passing through my face. After about 15 minutes of jeep ride, we have now reached our Zone ‘Dhikala Zone’. There were Lots of Jeep standing in the queue waiting for its approval to go inside. We also joined the queue. There are lots of binoculars vendors you will encounter at the entrance of the Safari Zone. One of them also approached our Jeep. Renting and Buying, both the options are available. We opted to rent the binoculars. Binoculars came a lot in use while on Safari. Seriously! One by one we started getting into the Forest. We were all excited for the coming view of any animal or bird. To be very frank, we were more interested in animals than birds. We set our binoculars ready so that we don’t miss even the farthest creature. The guide was dictating us the story behind the forest. Everybody was listening to him with keen interest. We came across the footprints of many creatures as also shown by the guide. Lots of birds also came across the way. I don’t remember the name of each bird. 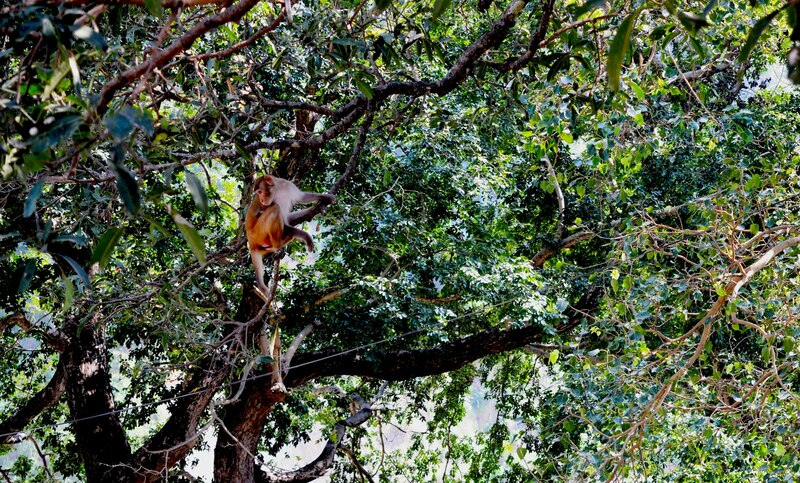 Monkeys were traversing from one tree to another as can be easily seen on trees coming on the way. Initially we were scared if any of them jump into our Jeep. In between ride, the driver took a halt of some time. It’s the place where you can rest and get freshen up too. This is the general place for all the safari visitors. As our jeep crossed a river in the forest, we could see a jackal resting at its bank. We waited for some time there to see if some other creature also can be seen here. As nothing can be seen here, we moved forward as we had huge interest in watching Tiger. We had heard a lot many times the failure stories about not able to view any tiger. People also say that there are no tigers at all or Presence of any tiger is just a myth. But we have also heard the success stories of many of the visitors. Getting to see the tiger is on luck or you need to leave for the Safari as early as possible. We were finger crossed and having all positive feelings about getting to see the tiger. We can say it’s our luck or the timings were perfect, our guide informed us that the tiger is nearby. We need to be very cautious and keep on moving slowly. Also we need to keep an eye at each angle and need to be very quick to see the tiger. Tiger can just run away in seconds from our view. I was feeling scared again for the very basic reason that the tiger may harm us. But the guide assured us for our protection from Jeep and the noise on road from which tiger or any animal maintain some distance for its own protection. But this statement proved itself wrong because we were left dumbstruck to see the Tiger crossing the pathway in front of our jeep and showing no concern about our presence. It seems they are so sure that nobody is going to harm him any way and we humans already have fear of him. He was not all showing any hurry to cross the path. Slowly he was moving on and we were silently mouth wide-opened watching him doing the activities. We later on realized that we forgot everything in those moments. Priceless moment nature has bestowed upon us. This Safari ride made our trip amazing and un-forgettable. On the way back from Safari, we got to see a pair of Elephant busy walking in the jungle. These two also had no concern with our presence. No Problem. We were very happy to see them. Corbett Museum is a life story of Jim who was a founder of Jim Corbett National Park. The museum covers a small area but is managed and governed properly by the authorities. It is a must to visit place if you have keen interest in knowing the history about the Jim Corbett National Park and its founder in brief. The museum is said to be Jim’s resident once upon a time. This house contains photographs, artifacts from Jim’s life, copies of letter and other forest related stuffs that showcase Jim as Wildlife lover. 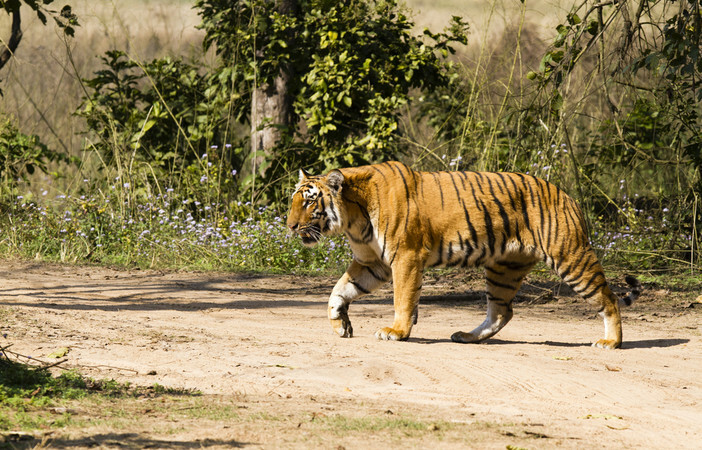 The Jim Corbett National Park is approximately 30 kilometers further from the museum. The museum is situated on Haldwani Road. Museum comes up with the entry tickets of Rs. 10 per person and adjacent to which there is a small souvenir shop. Corbett Falls is only fall in Jim Corbett. It is not a big waterfall but yes did visit for adding it up to the books of memory. It is not that much crowded and may be not that much popular. But people do visit it during peak season. Entrance to the fall can be done up to 3:30 PM and is open till 5:00 PM with an entry ticket of Rs. 70 per person. It is said that people do take bath under this fall. It is a fun place to enjoy with family and kids. It is situated nearby the Corbett Museum. We all had lots of gossips here and enjoyed the scenery nature has to provide us. Some of us were busy in making funny videos and few in capturing the pictures. Others were lost in gossiping while enjoying their snacks. 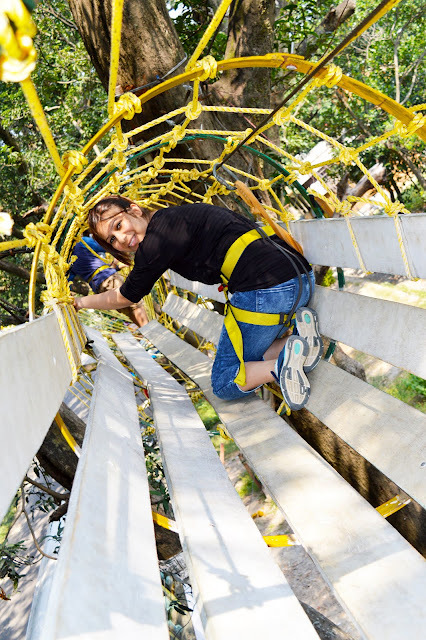 Devbhoomi Outdoor Adventure is situated merely at a distance of 1 kilometer from Hridayesh Resort. It consists of many fun filled activities that can be enjoyed if you are adventure lover. The games are not that difficult and can be performed even by kids. We were in a group so were kind of having gala time over here. Zip lining was one of my favorite sport activities available here. 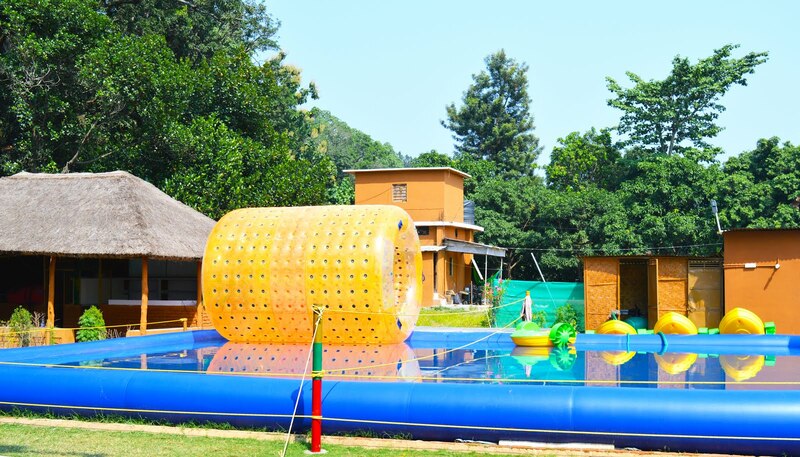 Other activities that can be done are 8-hurdle, free fall, bungee jumping, shooting, tyre hurdle, net hurdle, boating for kids, land zorbing, water zorbing, etc. 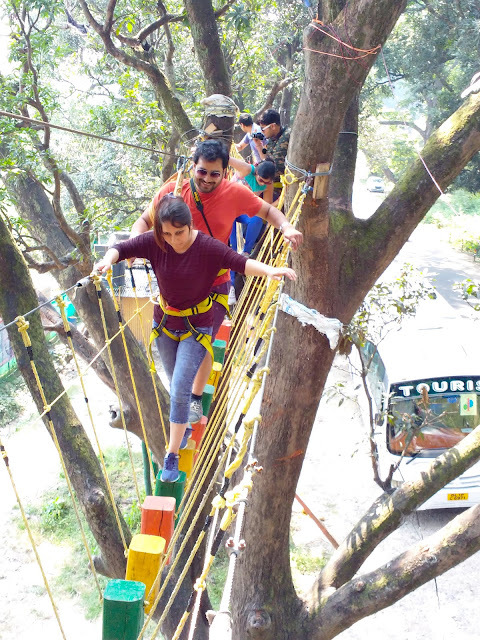 There is one more similar kind of place for fun activities, named as ‘Go Wild adventure Park’ located in village Terha in Ramnagar. It is situated 12 kilometer further from the resort. The places might have ended here, the trip might have ended here but the memories we made are everlasting. Even now when we turn back to revise our memories, see the pictures where we had posed together, our heart melts away. This is the time where we plan another trip to add some more into them. Thanks a lot.. Feeling great that you liked it.